Yea one if it’s the right guy. How many are transferring? Bertain, McCoy, and Hurtado? That makes 7 players in two seasons, over half the roster. Ehsan doesn't need to be looking any further than next season, so no transfers or projects that have to sit. It should be do or die time. NCAA tournament or pink slip. 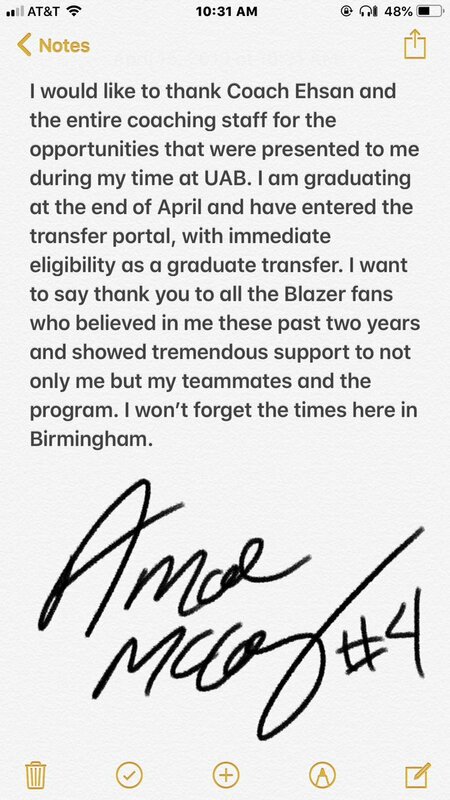 (04-15-2019 08:06 AM)BlazerGreen Wrote: How many are transferring? Bertain, McCoy, and Hurtado? McCoy's leaving could be a sign that the coaching staff feels good about who they are able to sign. If you're gonna have 2 or 3 players at the end of the bench who won't play anyway(no one has a 13 man rotation), there really is no difference between transfers who have to sit a year and practice players. The transfers would be better players, though. I agree that his window of opportunity is NOW, but I also agree with this logic. We had 3 or 4 players on the bench this year who contributed very little, so it wouldn’t be any different to have a good practice player who sits and gives us good years into the future. Coach Bartow seemed to always have room for at least one transfer sitting out a year, so I would be good with one, if we can get a good one. Over anxious pink slip alert. Under anxious sunshine pumper alert. Or, not to flame you but a walkon in McCoy leaving the second straight walkon to leave in two years shows that they think he's not a leader of men. Eshan has redshirted a guy every year and they haven't proven they've gotten better from it . Going back to the last decent roster( 2016) which Eshan sliced and diced up. We had 5 seniors and one transfer (JD) leave in 16. We brought in Mak,Zach,Perry,and Hurtado. We tried to get a transfer who didn't have the grades, and put McCoy on scholarship. We still had those two unfilled scholarships that ended up being Boyce and Lovan. And got two signed up. Three open scholarships a potential fourth could open with Hurtado. (04-15-2019 10:08 AM)ATTALLABLAZE Wrote: Sullivan disagrees with you. Great, but he didn't get better he finally was allowed to play. That McCoy is a good kid. (04-15-2019 09:18 AM)the_blazerman Wrote: Over anxious pink slip alert. Just repeating what many others have said, one more year to get it done. Signing anybody that will sit out is a gamble for Ehsan. What if somebody else gets hurt? What if one or more in this class aren't ready to play when they show up? What if Pearson never learns to play basketball? Can't pull a RS off an ineligible player. It might work out great for our program so if we can land a good player, I'm certainly not opposed. He just might not benefit the coach that signed him. Absolutely agree Ehsan needs to go All In on next season. Graduate transfers, JUCOs and freshmen who are immediately ready to make an impact like Zach. If I'm Ehsan, im not thinking too far beyond next season. The point is you can bring in as many 4-star players as you want but there are only 200 minutes per game available. Once a rotation is established there will be 4 or 5 guys who rarely, if ever, see the court. Whether next season is a make-or-break season or not, these end of the bench players who probably won't play could be players sitting out to make major contributions in future years. There is also the mental approach to the game players who were major contributors on their previous teams might have if they are relegated to the bench. We need shooters more than anything else. Shooters need to be able to get into a rythm which is very difficult if players are pulled off the court every 5 minutes to make sure everyone gets playing time. In 2 of Ehsan's 3 seasons at UAB, we've lost important players to season ending injuries. If I'm Ehsan, I want all 13 guys available to play this season. An undergrad transfer cuts you to 12 before guys even show up this summer, one of those coming off an ACL tear. You expect the newcomers to come in ready but as we saw with Azabueke that is not always the case. If we could get the kid from Wichita State, sign him up. I agree it's tough for UAB to turn a really good player down but I still think it's a risky move for Ehsan. Shoot for Brown, Boyce, and a sitting fifth big transfer from a P5/high major level. So we can have an excuse for this year.